This kit includes everything you need to start out in keeping a Praying Mantis. 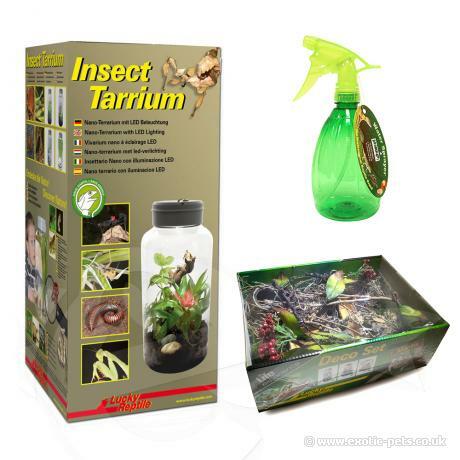 Included is a Lucky Reptile Insect Tarrium which is made of robust PET plastic. The removable LED lid contains a fine ventilation mesh, feeding door and an LED light unit with two daylight and one moonlight LED. A light sensor automatically switches over to moonlight when it is getting dark. Also in this kit is a mixture of natural and artificial decoration pieces including, branches, twigs, lichens, seed pods etc. specially selected for Praying Mantis. Please note that the decor may require a small amount of customisation to fit into the insect tarrium.